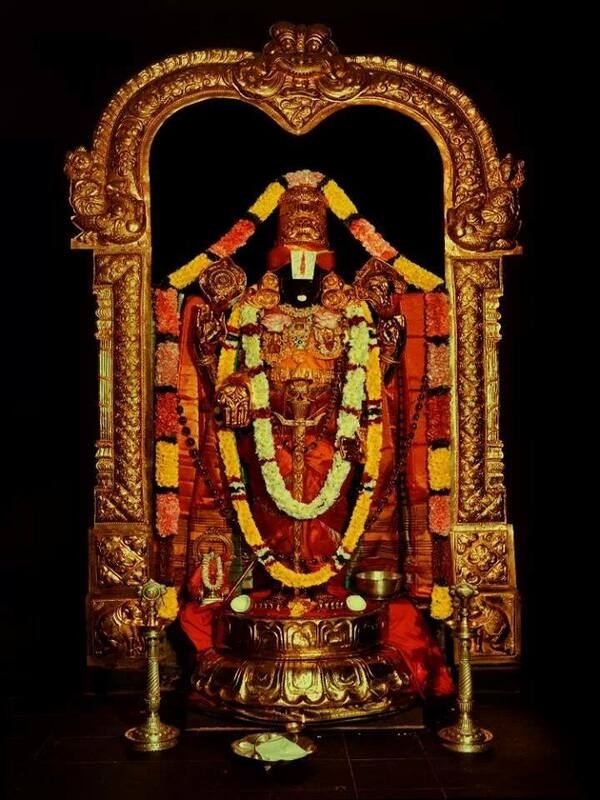 Holy Lord Sri Venkateswara,the principal deity or the moola virat of the world’s richest Hindu Temple -the Tirumala Tirupathi Temple – located on the hill top of Tirumala Hills,853 meters above the main sea level,is one amazing form of indescribable beauty and enormous grace.. 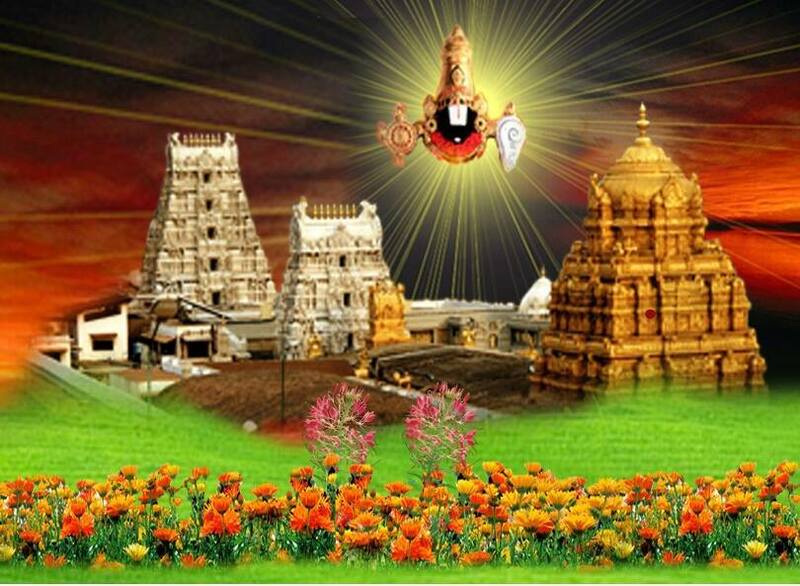 There are many references in the sacred texts of the Vedas and the Puranas that give a vivid description of the beauty of Lord Sri Venkateswara..Many medieval as well as modern period poets too have written volumes describing the beauty and glory of the Lord of the Lords,commanding the cosmic forces of this vast universe.. It may be for these reasons,I believe,that the holy Lord’s ever beautiful face is further adorned everyday in His holy abode of the Tirumala Temple – by it’s priests – with Vermilion,Turmeric and with a certain quantity of the paste of Sandalwood..
Quite surprisingly,His chin is paid all the special attention and is more remarkably adorned with Green Camphor,called Pachcha Karpooram in Telugu,by the Tirumala Temple priests..Although called Green Camphor this is a crystalline substance that’s actually white in color.. But why in the first case is the Lord’s chin adorned with Green Camphor..??? Sri Ramanujacharya,the famous 11th century Hindu theologian,philosopher and spiritual exegete,who is more popularly known as the expounder of Visishtadvaitha philosophy,was a renowned devotee of holy Lord Sri Venkateswara.. It was this Vaishnava acharya who introduced many methods of pooja rituals and spiritual activities in the Tirumala Temple..Even today it is these methods,introduced by Sri Ramanujacharya,that the temple authorities reverentially follow everyday..
Sri Ramanujacharya had also initiated many devotees of Lord Vishnu into Vaishnavism and the most prominent among them was one particular devotee called Sri Anantalwar..Sri Ramanujacharya once instructed this Anantaalwar to build a flower garden on the Tirumala hills..
Paying obeisance to his master’s instructions,Anantalwar,on one auspicious day,began the construction of the garden..In that massive divine task he was ably assisted by his noble wife.. It was for this reason Ananthalwar,in the very beginning of the work,told his wife..
“This is a very divine task our Acharya had assigned to us hence we would not be seeking assistance from anyone outside our family..We must carry this entire burden of building this garden,to the Lord,on our own shoulders.. The noble lady humbly obliged her husband’s orders..
Ananthalwar then engaged himself in the job while his wife started assisting him in almost everything he was doing there..One of the important jobs Ananthalwar assigned to her was to carry and move the soil from one place to the other..
However,that was not as easy a task as she thought it would be but nonetheless the great noble lady still decided to go ahead with her job braving all the odds that were against her during that period..
As she was also pregnant at that time,the gentle lady would easily get exhausted during the work which was,understandably so,quite an unusual task for any high society Brahmin lady to deal with..
As her husband Ananthalwar may not be observing his beloved wife’s predicament but the merciful Lord Sri Venkateswara was observing everything His ardent devotee was going through,at that time,both with sympathy as well as empathy..
After observing her agony for some more time,Lord Sri Venkateswara had finally decided “it’s time for me to interfere..”..
Lord Sri Venkateswara assumed the form of a 12-year old boy and started assisting Ananthalwar’s wife in her daily work by carrying soil from one place to the other.. This went on successfully for a few days..Unfortunately one day,Anathalwar suspected that someone was assisting his wife in her daily work..
On furthermore observation he found that a 12-year old boy was the one who was actually doing all her work..Ananthalwar could not control his anger..He was much upset with the boy as well as with his wife.. Not only for disobeying his orders but also the divine instructions of his master,Sri Ramanujacharya.. So he decided to punish the boy for intruding into his land,his work and also into his personal affairs.. Shouting loudly at the boy,Ananthalwar started running towards the boy,with anger,after noticing him from a distance..Seeing Ananthalwar approaching him,Lord Sri Venkateswara in the boy started running towards the Temple to escape his wrath.. Picked with his right hand.. The crowbar,he was thus far handling in the garden area to dig a pit.. Thrown it at the tender boy..
Unmindful of what he was doing that moment..
And unmindful of what a life threatening damage that the sharp object would do to the boy..
My beloved reader..Here you need to understand the cosmic games our wanton Lord Sri Venkateswara sometimes plays..
Ananthalwar was a great Gnani but as fate would have it,he was completely blinded by the ruthless game of Vishnu Maya,that moment,and had mercilessly thrown the crowbar at a cute looking boy which he wouldn’t have,in normal circumstances,even dreamed of doing.. But he still did that just because he was under a powerful spell of Maya or delusion in thaose particular moments and was completely blinded by his ignorance.. But that was too late.. The crowbar that left the hands of Ananthalawar..
Witnessing that unruly incident of a ghastly character,all the five elements of Nature – Prithvi, Akash, Jal, Agni and Vayu – and all the Ashta Dikpalakas went into a deep shock and remained speechless for a pretty longer period of time without performing their duties towards humanity.. They all,during that shocked silence,tendered their apologies to holy Lord Siva,the father of Nature,and prayed to Him to forgive them for standing witness to such an unholy and sinful incident..
After that ghastly incident,our beloved holy Lord Sri Venkateswara,who was in that 12-year old boy until that moment,quickly disappeared.. It was after seeing the hurt boy disappearing in front of his eyes that a shocked Ananthalwar had realized what a grave error he had,in a fit of rage,committed.. He immediately turned back and started running and running and running and running towards the holy Tirumala Temple and reached the Maha Dwaram there.. He paused there for a few minutes to gather breath and later with the same speed rushed inside into the sanctum sanctorum area of the Tirumala Temple and reached the most sacred place in this universe,the place in front of the Garbha Griha of Sri Varu..
And there he found the ever smiling Murthy of Lord Sri Venkateswara standing majestically in front of him..
Ananthalwar’s whole idea was to tell everything to the holy Lord Venkateswara and explain Him in detail about what extensive damage he had unknowingly and in a fit of rage had caused to a 12-year old boy, that day.. 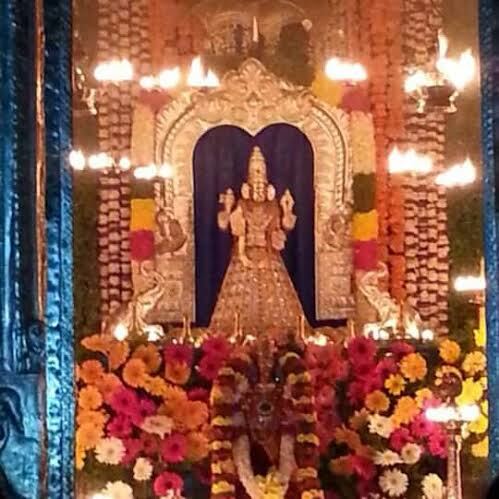 The poor Ananthalwar was under the impression that he had just wounded a noble saint who had come to his garden area in the form of a boy to help his pregnant wife..
His thought that moment was to confess everything in front of the moola virat of the holy Lord and then seek his divine mercy.. 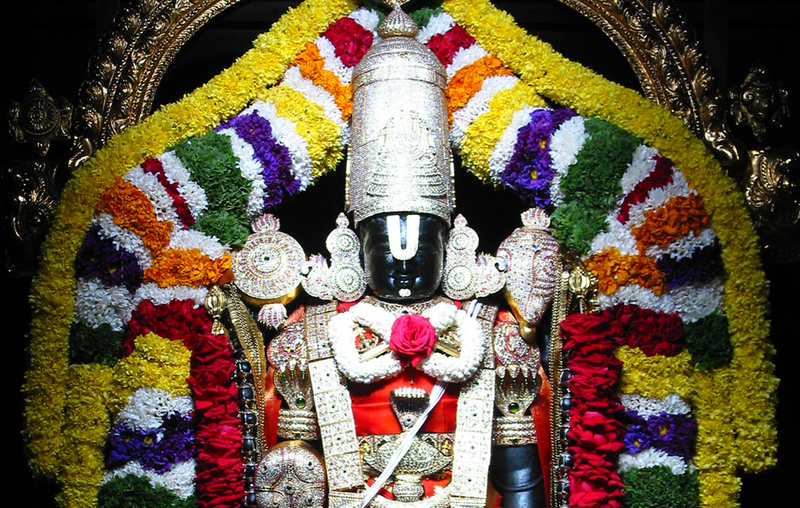 But when Ananthalwar entered the Garbha Griha of the holy Tirumala Temple and saw the ever smiling Murthy of Lord Sri Venkateswara in front of him,he went into a deep shock,perhaps the deepest shock of his life,after seeing the Lord’s bleeding chin under those enigmatic smiles..
Ananthalwar finally broke down into endless tears..Prostrating before the sacred Lotus feet of Lord Sri Venkateswara,this was how he surrendered himself to the Lord’s mercy..
And it was exactly during those divine moments,that the ever smiling Lord Sri Venkateswara finally spoke..
And this was what He said..
“My dear Ananthalwar..You are in no way responsible for anything that you have so far done in your life including this sin that you think you have unknowingly committed today..So don’t worry..
No matter what I do and how I do,I do not allow you humans know the reason for that and caste a spell of maya around you and make you all insensitive to what you are doing..I have done the same thing in your case too,today..So don’t think you have committed any sin.. Remember Ananthalwar..This is a cosmic truth and only those noble souls like you who are destined to know this truth would be knowing it and not everyone..You are now exonerated from the sin you have unknowingly committed today..
Saying so,the holy Lord stopped His speech..
Ananthalwar,who was in a dazed state until that moment quickly moved forward and gently applied the Green Camphor to the chin of Lord Sri Venkateswara as ordained by Him.. Everyday this Green Camphor application is cautiously removed and carefully preserved by the Temple priests..Later,a very small portion of this camphor is packed into five hundred small covers and offered as Prasad to devotees,mostly V I Ps,who visit the Tirumala Temple,everyday.. Since this Green Camphor is collected directly from the Lord’s chin,it is believed by many,that it assumes many miraculous powers and offers great help to the devotees who later use it..
* When applied on the forehead along with Kumkum (Vermilion) this Green Camphor is believed to be offering the blessings of the Lord directly to a devotee..
* When taken with milk daily in the morning,this Green Camphor is believed to be as sanctimonious as the Prasad of the Lord. * When placed in the money chest,along with Saffron,it is believed that this Green Camphor enhances the riches of the devotee..
* When applied by businessmen on their forehead everyday,it is believed,that this Green Camphor earns them amazing growth and profits in their business..
* When a sweet delicacy is prepared by adding this Green Camphor to it and offered as Naivedyam to the holy Lord,it is believed that it would immensely please Him..And when the same Naivedyam is offered as Prasad to friends and relatives it would bring great prosperity to their houses by removing all their obstacles. * If a devotee offers this Green Camphor to a Temple he would earn great honor and respect from the society..
* When a devotee donates this Green Camphor to poor Brahmins,he shall witness a quicker settlement of all his pending issues..
* When infertile mothers add this Green Camphor to milk and perform Abhishekam to Lord Kartikeya also called Subrahmanyeswara,and then take this milk as Prasad,they would be immensely blessed by the holy Lord Venkateswara with a child..
* When this sacred Green Camphor is mixed with water and drank everyday by a devotee,all his gastro intestinal disorders would go..
* When mixed in water and applied on the nose,chest and forehead,this Green Camphor would offer great relief from headache and cold. * When applied to hair,after mixing this Green Camphor in oil,it would not only add great fragrance to the devotee’s hair but would also keep his head cool and calm.. The next time you visit the Tirumala Temple,make it a point to visit this flower garden,built by the noble Ananthalwar and his wife,which you would find on the right side of the Tirumala Temple..
There’s also a water tank called the Alwar tank just beside this flower garden supposedly dug by the noble Ananthalwar..
You may also find the crowbar with which Ananthalwar had hit Lord Sri Venkateswara’s chin,hanging to the right side of the main entrance that guides you to the Garbha Griha of the Tirumala Temple..